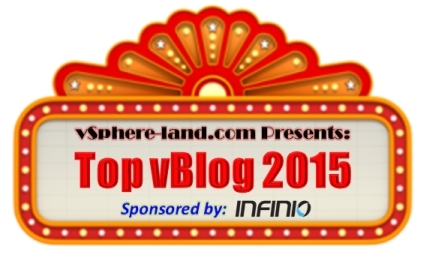 Vote for your favorite virtualization blogs 2015! Every year in February Eric Siebert (@ericsiebert) organizes the annual Top vBlog voting at his site vSphere-land.com. You can vote for every blog listed in the vLaunchpad – with more than 300 blogs the best source of virtualization links ever. My blog Running-System.com is one of them, and at the blog voting last year I finished up in an unfortunate 101th place (barely missed the top 100…). So my goal for 2015 is to make it at least to place 100 – therefore I need your help! This year Infinio is so kind to sponsor the contest. Maybe you want to follow them on twitter (@Infinio) or take a look at their website/products.